Employing X:BLEND fiber formula, this impressive Long Range VECTR Sock features olefin yarns for outstanding hydrophobic performance to wick moisture with impressive speed to keep your feet cool and dry. 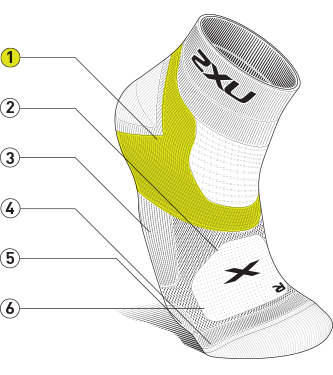 Employing 2XU’s X:BLEND fiber formula, this impressive Long Range VECTR Sock features industry leading olefin yarns for outstanding hydrophobic performance to wick moisture with impressive speed, keeping feet dry. Engineered with 2XU’s proprietary X:LOCK support system for a secure, ergonomic fit, impressive abrasion resistance is offered alongside ankle and arch stability for enhanced landing and push off. Light weight yet highly durable, the Long Range VECTR Sock is perfect for endurance and multisport events. Engineered for faster performance, the Race VECTR Sock is designed with our X:LOCK Support System for a secure, ergonomic fit and stabilization of the ankle and arch. Engineered for faster performance than ever before, this impressiveRace VECTR Sock is designed with 2XU’s X:LOCK support system powered by 2XU’s Compression technology for a secure, ergonomic fit to the foot and stabilization of the ankle and arch. Delivering maximum abrasion protection, extra heel and forefoot cushioning, dry mesh panels for ventilation plus a linked toe cage for comfort, theRace VECTR Sock is ideal for racing and training alike. Utilizing 2XU’s X:LOCK support system powered by 2XU Compression technology, the Cycle Vectr Sock is an innovative cycling essential. A highly secure fit offers stabilization for the foot, arch and ankle for minimum abrasion. Reinforcement through the heel, ventilated mesh panels and a linked toe cage design assure comfort. Longer sock for increased blood fl ow into the foot.